OPENING OF THE INTERNATIONAL HORTICULTURAL EXHIBITION. 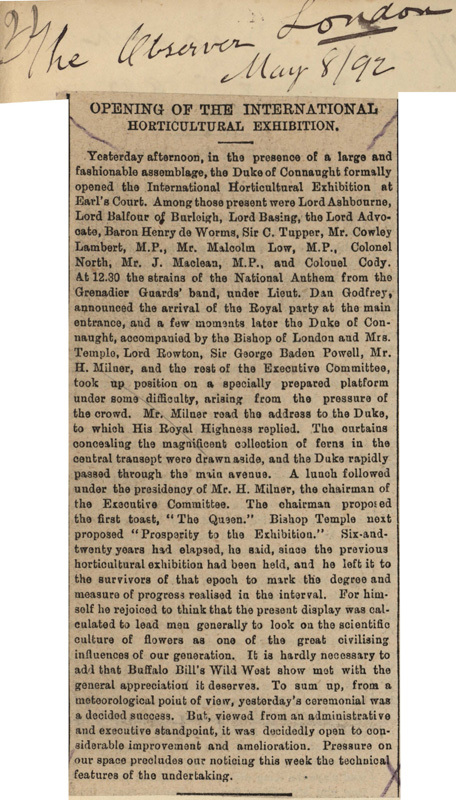 Yesterday afternoon, in the presence of a large and fashionable assemblage, the Duke of Connaught formally opened the International Horticultural Exhibition at Earl's Court. Among those present were Lord Ashbourne, Lord Balfour of Burleigh, Lord Basing, the Lord Advocate, Baron Henry de Worms, Sir C. Tupper, Mr. Cowley Lambert, M.P., Mr. Malcolm Low, M.P., Colonel North, Mr. J. Maclean, M.P., and Colonel Cody. At 12.30 the strains of the National Anthem from the Grenadier Guards' band, under Lieut. Dan Godfrey, announced the arrival of the Royal party at the main entrance, and a few moments later the Duke of Connaught, accompanied by the Bishop of London and Mrs. Temple, Lord Rowton, Sir George Baden Powell, Mr. H. Milner, and the rest of the Executive Committee, took up position on a specially prepared platform under some difficulty, arising from the pressure of the crowd. Mr. Milner read the address to the Duke, to which His Royal Highness replied. The curtains concealing the magnificent collection of ferns in the central transept were drawn aside, and the Duke rapidly passed through the main avenue. A lunch followed under the presidency of Mr. H. Milner, the chairman of the Executive Committee. The chairman proposed the first toast, "The Queen." Bishop Temple next proposed "Prosperity to the Exhibition." Six-and-twenty years had elapsed, he said, since the previous horticultural exhibition had been held, and he left it to the survivors of that epoch to mark the degree and measure of progress realised in the interval. For himself he rejoiced to think that the present display was calculated to lead men generally to look on the scientific culture of flowers as one of the great civilising influences of our generation. It is hardly necessary to add that Buffalo Bill's Wild West show met with the general appreciation it deserves. To sum up, from a meteorological point of view, yesterday's ceremonial was a decided success. But, viewed from an administrative and executive standpoint, it was decidedly open to considerable improvement and amelioration. Pressure on our space precludes our noticing this week the technical features of the undertaking.